Be safe out there tonight, especially if you're taking the kids trick-or-treating. We don't get any trick-or-treaters at our house, which makes me sad. We live on the corner of a busy street. I guess it's too dangerous even with the sidewalk. I'll be going to a costume party instead of handing out candy tonight. I've added a nifty badge to the sidebar that identifies me as a member of NaBloPoMo (short for National Blog Posting Month). The main objective of this organization is to challenge bloggers to post something to their blog each day during the month of November. Jensational (fellow blogger and good friend) invited me to do this. She's hip to all the latest, greatest news. I'm saving my material for November. Come back Thursday, November 1. If you want to read some really interesting stuff now, please check out the posts about my friends' (yes, punctuation snobs, two friends went together) trip to Turkey over at Planet Lu. Ted's Trees in Austin rocks! We met Ted himself on Saturday and picked out these BIG trees. Ted gave us, "the deal of the century." The crew delivered and planted our trees today. Now we have a mini-forest instead of a big, empty backyard. I've been sick the past two days with a half-dozen yucky symptoms. My head aches too much to read a real book. I did muster the energy to look at the mail after a dose of ibuprofen. 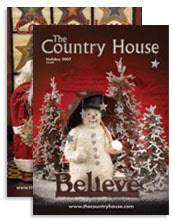 The Country House catalog featured a delightful looking snowman on the cover. Normally I am not a fan of country decor, but since it was about 90 degrees out today, I decided to escape into the glossy, glittery, faux-snow pages of this catalog. Some of the products that caught my eye featured homespun, wry witticisms that I'd like to offer up for your pondering. I have learned that being with those I love is enough. I'll love you 'til the day after forever. Live in such a way that if anyone should speak badly of you no one would believe it. It doesn't matter where you go in life, it's who you have beside you. Who are these children and why are they calling me Mom? It's never too late to live happily ever after. Never get so busy making a living that you forget to have a life. What happens at grandma's stays at grandma's. Being happy doesn't mean everything is perfect. It means you decide to see beyond the imperfections. Motto to live by: Life should not be a journey to the grave with the intention of arriving safely in an attractive and well-preserved body, but rather to skid sideways, chocolate in hand, latte in the other, body thoroughly used up, totally worn out and screaming "WOO HOO, what a ride!" As a remedy to the 2 inch gap under the current interior doors, I thought I wanted to replace our yucky hollow-core doors with some nicer solid-core doors. I picked out the new doors and hardware. I kept the budget very reasonable. I met with the door installation contractor. The contractor, a polite man who was articulate and seemed sane, said that he couldn't just hang new doors with new hardware. Instead he would remove all the current door frames and trim with a crowbar and install new, pre-hung doors with new frames and new trim. He went on to explain (with a straight face) that it's easier for him and less costly for me, the customer, to just replace the whole door set-up. It made sense when he said it. I thanked him for his time and showed him out. The more I thought about the project, the more I realized that neither Chad nor I want to paint the new doors and trim. Nor do either of us want to watch as the patch-jobs we did on these 55-year-old walls crumble to dust under the pressure of a crowbar. Nor do we want to have sheetrock replacement added to the project list. Nor do we want to come back through this freshly painted house with four different colors of paint for the touch-ups after the crowbars are applied to our walls. Nevermind. These doors are fine. I hardly notice that gap under the doors. My eye now breezes right over that spot where someone painted over stickers on the bedroom door rather than removing them. My consolation prize of sorts was to replace the old doorknobs with new ones that match all the other hardware in our house. With my trusty electric screwdriver, I had all the old knobs out and all the new knobs in place in just over an hour. It was a nice surprise for Chad when he got home from his day trip for work. As of Monday evening at 8:25 PM, I am no longer part of the coveted 18 - 34 year-old marketing demographic. I don't feel old. I don't think I look old, but people are increasingly referring to me as "Ma'am." I hate that. I was raised to say ma'am and sir to anyone older than I was, a very southern verbal affliction that was strictly enforced at my house. Now I hate, hate, hate it when a teenager or a 20-something-year-old says ma'am to me. Please stop. It was a fun birthday weekend and a good birthday. Chad & I went on the Austin American Institute for Architects tour of homes. We both agreed that most of the houses were too huge, offered too much glass with too little privacy, seemed more like commercial showplaces than personal sanctuaries and that some of the houses were just plain ugly. We like our little, cozy 1952 house. Saturday night we walked around South Congress Avenue, stopping to share a yummy cupcake at Hey Cupcake. We also stopped in this new candy store called Big Top. The store was circus themed and offered all sorts of odd candy, flavored sodas, milk shakes, malts, popcorn and ice cream. I got clove candy canes and raspberry M&Ms. Chad got licorice bridge mix - ewww. On Sunday we had afternoon tea at the Four Seasons hotel. The view of Ladybird Lake was lovely and the Four Seasons lobby lounge was plush and posh. The bill was also posh. I think I can recreate the experience with a French press, fresh tea leaves and some mini dessert tarts from the Whole Foods bakery next time I want a fancy tea party. Monday I went to lunch at Homeslice Pizza (my fave!) and went shopping for 2 hours at Emerald's. It was me-time. I loved it. I came home to find that Chad had taken off from work at 1:00. Chad cleaned the house, made my favorite ginger drink, ordered veggie Asian food (yum!) and invited some friends over. He also presented me with my gift, a comfortable reading chair in the office from IKEA. Sonic (our big, boy cat) had pooped on my old reading chair too many times. The old dish chair with the super-thick cushion was just too tempting and comfortable a place for Sonic to resist. Hopefully the new chair seems more like furniture, and Sonic will not poop on it. (He doesn't poop on any other furniture, only that old dish chair. Weird cat.) Chad put a plastic sheet over the new chair while he waited for me to get home, because he wanted to keep the cats off of it. Sonic decided that no silly, plastic sheet was going to stop him, and he found his way under to snuggle into the new chair. His newest nickname is "boy in the bubble." I think that this photo says it all. I love my new chair! My birthday cake featured very bright, hot-pink frosting. The food dye was surely not from anything found in nature. We all had pink teeth, pink mouths and pink lips after eating it. Yep, Chad picked the color all by himself! I found a new, super-yummy meat substitute. Those of you who love the McRib (McDonalds processed rib-like sandwich) are nuts, but as a public service to cute little piggies everywhere, I am urging you to try these BBQ riblets by Gardenburger brand. The riblets come in a tangy sauce and have a meaty texture. Three and a half minutes in the microwave and dinner is done! Look for them in the freezer section at your grocery store near the other vegetarian products. I haven't eaten red meat for about three and a half years. Easy to do! Once in a while I'd smell barbecue brisket and salivate like Pavlov's dogs, but I could get my fix with some barbecue chicken or turkey. 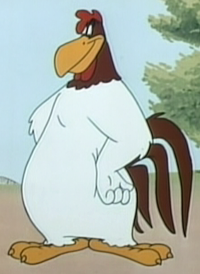 I haven't eaten poultry since July 4 of this year. I'm still eating fish, but I don't really like fish. At all. So I only eat fish when I'm really craving protein, about once every two weeks. I had salmon for dinner tonight. It just isn't the same. I want some chicken. Trying to picture cute, fuzzy baby chickens. Reminding myself about horrible conditions at poultry processing plants. Imagining the horrific secret chemicals, antibiotics and genetic engineering that go into raising poultry these days. Mmmmmm... chicken. I mean, oh no, it's horrible. Ewww, it had a face and a momma. Obviously I'm very conflicted at this time. I need to eat some beans maybe for a jolt of non-meaty protein.